Everything Hindu ancestors did had a purpose and meaning. Harmony with nature and positive energy was of prime importance to Hindus. Here is a look at the hidden spiritualism in the architecture of old Hindu homes in South India. 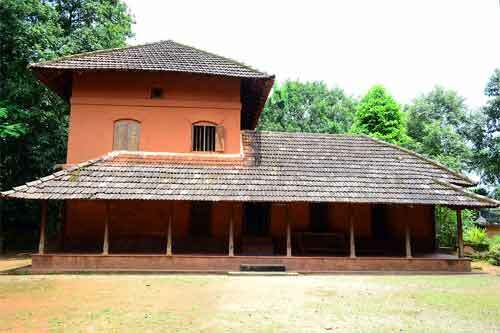 Some of the old Hindu homes in South India were noted for its unique linear, architecture – especially the steps, small entrance door, walkway etc. Most of the houses had entrance steps referred as ‘Padi’ in local languages. The term ‘padi’ also meant to learn – this symbolically denotes acquiring knowledge – learning of Vedas, Upanishads and other scriptures. Ego sets in when one acquires knowledge. Therefore the four steps usually led to a door which was small in height. Except for children (who are without ego) all the people had to bow down to enter the house. Symbolically, this taught one to be humble and to drop the ego even if one had acquired vast knowledge. The small door led to a long walkway. This symbolically suggests that there is no point in acquiring knowledge, if you do not live by it. The walkway thus symbolically suggests a person live by the knowledge he has acquired it. The walkway leads to a hall - a place of get together. This symbolically suggests that instead of sitting on the knowledge acquired one has to share and discuss it with other learned people. It is when we rub our knowledge with other people that we come know about its fallacies and greatness. After this on the sides there are the other rooms which symbolically represent worldliness. The knowledge gained is put to test in the world. One performs one’s karma being rooted in teachings of the Upanishads. Next is the kitchen (in linear architecture this comes after the hall). By the time one enters the kitchen, the knowledge is seasoned and matured. From the kitchen is the tail end of the house, which has entrance to the outside of the house. This symbolically represents Moksha or liberation.